RSVP on the event page or on the Eventbrite page today! The AIAA Houston section would like to recognize the achievement of one of its members, Dr. Robert E. Skelton, for receiving the AIAA Mechanics and Control of Flight Award for 2017. The award is presented for an outstanding recent technical or scientific contribution by an individual in the mechanics, guidance, or control of flight in space or the atmosphere. Congratulations, Dr. Skelton! We are proud of your accomplishments as a member of the Houston Section and are very pleased to hear of your winning of the Mechanics and Control of Flight Award. The keynote speaker will be Dr. John B. Charles, Chief Scientist of NASA’s Human Research Program. RSVP on the event page or on the Eventbrite page. Join the AIAA Houston Section and Mr. Wayne Hale, former NASA Engineer and Space Shuttle Program Manager on Thursday, June 18, 2015, 5:30m at the 1940 Air Terminal Museum, an AIAA Historic Aerospace Site. Additionally, we will be celebrating a year of accomplishments and acknowledging members that are celebrating an anniversary with AIAA or a membership upgrade to Senior Member, Associate Fellow, Fellow, and Honorary Fellow. For more information and to RSVP, please visit the event page. 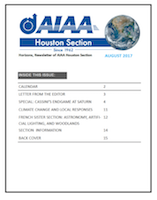 RSVP for the AIAA Houston Section Awards Dinner Meeting on the event page today! The awards dinner meeting is happening Thursday, June 26, 2014, 5:30pm, NASA JSC Gilruth Center, Alamo Ballroom.